We’re a little lacklustre this week due to moving house. Two trips to Norwich so far, a couple more to go before I’m fully settled. It feels weird having two houses, hell, it is weird having two houses. One which I have loads of stuff to do in, and the other that I have hardly anything to do at all. Apart from bake. So I took some plums and my pie dish and my scales up to Norwich and made some pie. Baking is a welcome constant, as well as watching the West Wing – they offer comfort in a time of not really being sure what on earth I’m supposed to be doing with my time. One thing I did forget was my rolling pin, so the pie was decidedly rustic-looking, and then managed to spew plum juice all over the oven whilst cooking. There’s nothing like endearing yourself to your new housemates by burning plum juice onto their oven. I should’ve known better really, as plums are particularly juicy when cooked, and pastry isn’t a great sponge. Oh well. Next week I will be continuing my travels back and forth, trying to find a job before I go out of my mind with boredom, and baking Coffee and Chocolate Loaf. This is one of many variations of pie. 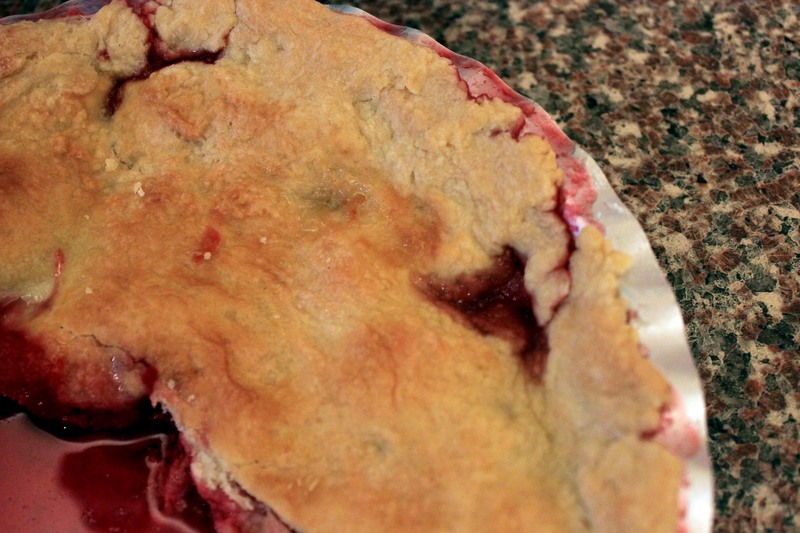 Basically if you get any fruit and put pastry over the top of it, you will have this pie. I told you it was lacklustre. 1. Preheat oven to 200C. Combine flour and butter until crumb-like in consistency. Slowly add water until the dough comes together. 2. Destone and chop up plums. Place in pie dish. Roll out pastry and lay over the top of the dish. Brush pastry with milk or egg. 3. Bake for 40-45mins. Beware excessive plum juice.